A Velociraptor appeared in the Late Cretaceous period and lived 75 to 71 million years ago in what is now known as the Mongolia. In reality, the creature was no bigger than a wolf, measuring up to 6.8 feet in length, 1.6 feet high and weighed up to 15kg. It was covered in feathers and was more similar to a bird. It had a long claw on the second toe of both feet that was 8cm long. It was first discovered by paleontologists in 1923 during an American Museum of Natural History expedition to the Outer Mongolian Gobi Desert. Peter Kaisen recovered the first Velociraptor fossil. In 1924, museum president Henry Fairfield Osborn classified the fossils of his new genus, Velociraptor. 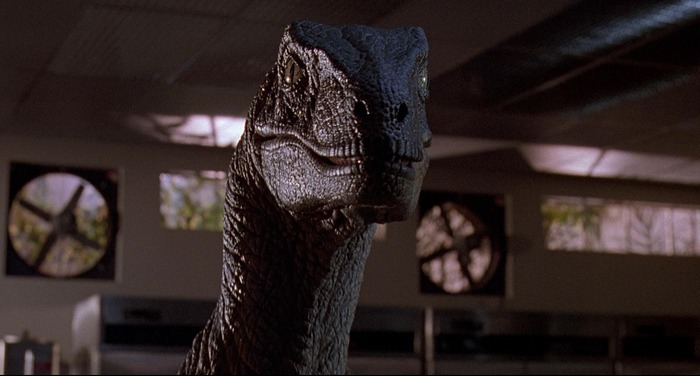 Throughout all the Jurassic Park films, Velociraptors frequently appear on the islands. The creatures here differ greatly from their real-life counterparts. They are much bigger, have different hands and have no feathers. They are much more reptilian in nature. They are extremely intelligent and hunt in packs. The creatures seen in the movies could well have been based on Deinonychus which have similar traits. A velociraptor appears in the very first scene in Jurassic Park when Muldoon and his team try to bring a female into the park. It attacks one of the team members and they are forced to shoot it. They don’t appear then until far later in the film when Ellie and Muldoon have to restore the park’s power systems. Muldoon realises they’re being hunted by them and tells Ellie to run to the power shed as he tracks a Velociraptor with his gun. She restores the power and finds what’s left of Ray and she narrowly escapes from a Velociraptor. Muldoon is still tracking a raptor when the female ambushes him, killing him. The raptors appear again in the visitor center when Lex and Tim are eating. They hide in the kitchen and avoid being detected. They managed to trap one of them and escape. The raptors catch up with the group in the control room so Ellie, Dr. Grant, Tim and Lex escape through the vents and into the main lobby area of the visitor center. They fall to the ground and are about to be attacked by two Velociraptors when the Tyrannosaur appears, killing both of them. The survivors use this opportunity to escape the island. The Velociraptors appear once again towards the end of The Lost World. When Roland’s team escape the Tyrannosaurus at their camp, they wonder into the tall grass. The raptors close in on them and start picking the team off one by one. Dr. Malcolm, Kelly and Sarah make it to the compound in the middle of the island. One of the raptors jumps on Sarah’s backpack and Sarah and Kelly flee into a nearby building with two raptors in pursuit. Malcolm tires to evade the other one by hiding in a nearby building and then inside a car. The other two velociraptors make it inside the building and Sarah and Kelly climb to the top. Kelly uses her acrobatic skills to impale a raptor on a metal pole. They escape through the top of the building with the other one right behind them. It falls off the roof and onto the other raptor on the ground. They start fighting each other which gives Sarah and Kelly the opportunity to escape. 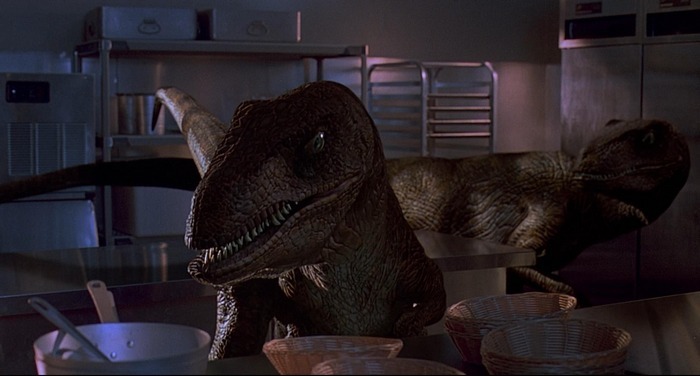 Given the recent paleontology discoveries and theories about Velociraptors since Jurassic Park and The Lost World was made, the raptor designs in Jurassic Park 3 had some noticeable changes. 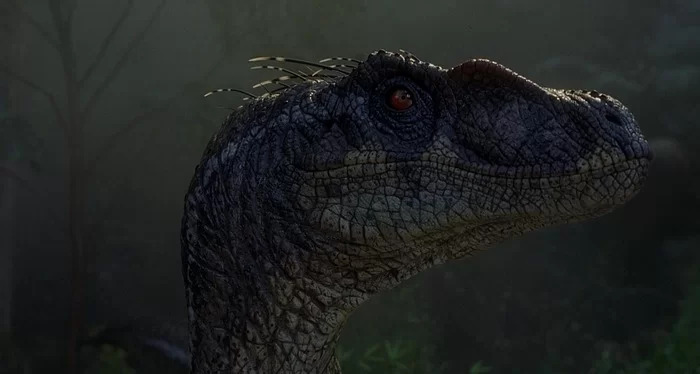 The male Velociraptors had quill-like feathers on the backs of their heads though they weren’t applied to their entire bodies as this is very difficult to animate. In the third movie, we also learn much more about their intelligence and how protective they are over their eggs. 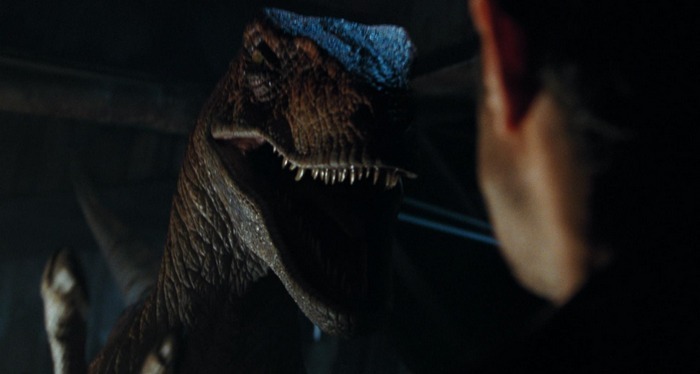 The film starts off with Dr. Grant and his colleague Billy discussing a Velociraptor’s communicative intelligence. Billy uses a 3D printer to replicate the larynx of a Velociraptor. When Dr. Grant and the group get stranded on the island, his colleague Billy steals two Velociraptor eggs unknown to the others. When the survivors reach the abandoned laboratory, a raptor sneaks in there and attacks Amanda Kirby. The group runs to the cages and traps one of them. We see its communicative abilities when it actually calls the other Velociraptors for help. The survivors run through a group of Corythosaurus and Parasaurolophus and into the forest. Amanda, Paul and Billy hide in the trees while Dr. Grant is still on the ground. The raptors injure Udesky and set a trap to lure the others down from the tree. 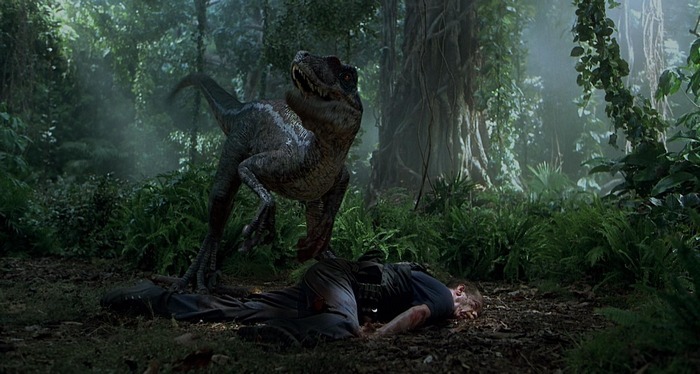 Amanda Kirby almost falls from the tree but is saved and Dr. Grant is confronted by a Velociraptor. Eric Kirby comes to his rescue and sprays a gas can and the raptors flee. We then see the raptors at the climax of the movie when the survivors are making their way back to the beach. The Velociraptors surround the group and the female raptor challenges Amanda Kirby for the eggs that Billy stole earlier. She hands over the eggs and Dr. Grant uses the imitation raptor larynx to fool the raptors into running off. The survivors then escape the island. This is my favorite dinosaur of all time. I love raptors! I feel like velociraptor is overrated . I like the less well known deinonychosaurs like Utahraptor , Dakotaraptor ,and Bambiraptor. The brave and smart dinosaur, amazinggg!!! In the 4th movie, Jurassic World’s trailer, the guy, I think his name (in the movie) is Owen (played by Chris Pratt) is riding with those guys (the velociraptors). I think that scene is AWESOME!!! I REX VS RAPTORS!! !WHO will WIN!!! 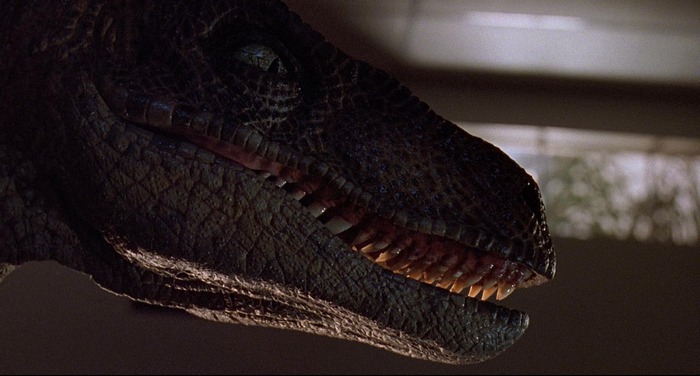 Don’t you think it’s funny that that the velociraptors KILLE UDEDsky? Get it? KILLED and the DED (Sounds like Dead) in Udedsky. If this is real RUN !!!!!!!!!!!!!!!!!!!!!!!! !FOR YOUR LIFE!!!!!!!!!!!!!! I want a pet raptor!! But if you get a pet raptor youll need to train it . 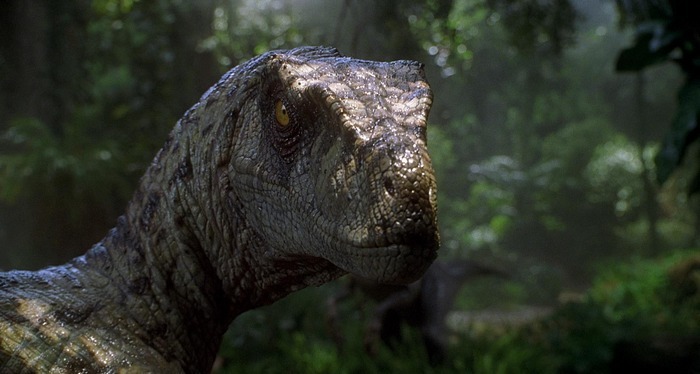 My friend refused to listen that the velociraptors were actually another dinosaur……. He flipped out. I like Blue. Did you ask this question on the Indominus rex page?! The text doesn’t say anything about Velociraptors in Jurassic World, right? So maybe the raptors in the fourth film is actually Deinonychus. Should I get the 3d model of Velociraptor for personal use ?